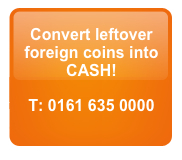 If you have left over Swiss Francs that you can’t change into Sterling then use our service at Cash 4 Coins. We exchange Swiss Francs back into £GBP – our service is fast and easy to use and you get to change that unwanted currency into useful Sterling! To see just how simple it is please take a loom at the simple step by step guide on the page ‘How to send us your coins‘ Our aim is to make it as easy as possible for our customers to exchange Swiss Francs into Sterling or the currency they desire. We can also change Euros into Sterling and old British coins into US dollars. The choice really is yours! The bank will obviously not change obsolete coins into Sterling or any other currency for you, but we can. For the banks, this is a huge logistical undertaking and not really worth their while, but because we specialise in the exchange of Swiss Francs and many other currencies we are always happy to help. In fact, our team has a vast knowledge of coins in circulation now and also those that are no longer legal tender. Whether you have old Swiss Francs or obsolete British or Irish coins, we can help you to make use of this otherwise useless money. As you’d imagine the Swiss Franc is the currency of Switzerland but not many people know that it’s also the currency of Liechtenstein. Liechtenstein is also allowed to mint it’s own coins, however this is only usually done for special occasions and commemorations. The Swiss Franc has traditionally been on of the worlds most stable currencies to to the fact that 40% of the currency in general circulation is covered by gold reserves. The Swiss Franc was unregulated up until half way through the 19th century and was often perceived as complex and variable. This is because many areas within the country produced their own versions of the coins as well as private banks producing their own banknotes. Many people have collected various foreign coins and banknotes over the years from holidays and work trips abroad – UK Banks will not change the coins back into Sterling so people are left with unused and worthless foreign currency sat in a ‘change jar’ or ‘junk drawer’. However our service will liberate your unwanted coins and turn them into cold hard cash! We work with all currencies and will exchange Swiss Francs, Euro coins and notes, US and Canadian Dollars, Krona, Pesetas and in fact any currency. So if you’ve collected a load of Swiss Francs from trips to Switzerland and want to get some money for them then use our foreign currency buying service. We will exchange Swiss Francs and turn them into £ for you. Why not take a look around your home now or club together with friends and family to exchange Swiss Francs in the most convenient way possible. Turn this worthless metal into money in the bank that you can use!